An Israeli strike on Tuesday killed two militants of the Gaza Strip's ruling Hamas movement after shots were fired at soldiers, Gazan and Israeli officials said. 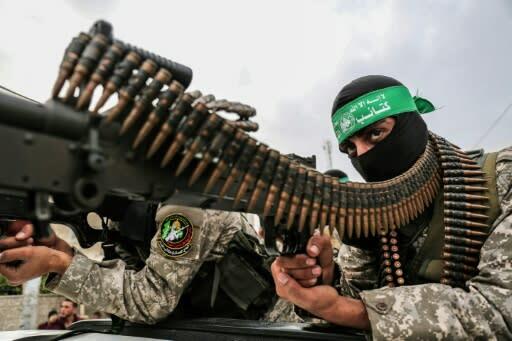 The Islamist group's military wing, the Ezzedine al-Qassam Brigades, confirmed in a statement that the dead men were its fighters, naming them as Ahmed Murjan and Abdel-Hafez al-Silawi. It said a series of explosions had targeted a military site while it was being visited by senior leaders, without naming them. Palestinian security sources said that the Israeli attack was in the north of the strip. The military said it was prepared "to target any aggression against Israel and holds Hamas responsible for everything happening in and from the Gaza Strip." Speaking later, Hamas leader Ismail Haniya condemned what he called a "crime." He said the movement was facing "rapid political and field developments." Israel says any such return would mean its end as a Jewish state.